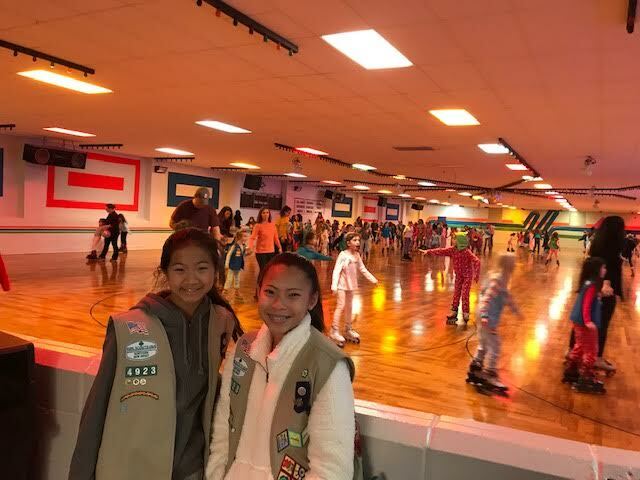 ​On January 5, 2019, Morristown Girl Scout Troop 94923 once again hosted its fantastic annual Pajama Skate Party, now in its sixth year. Led by 8th grade Girl Scout Cadettes Micaela Cassidy (right) and Seleyna Bautista (left), over 200 Girl Scouts from 25 troops attended this exciting event wearing their pajamas, having the time of their life and skating with friends at the Florham Park Roller Rink. The always philanthropic Girl Scouts did some good by collecting old denim to donate to Blue Jeans Go Green, a venture that converts the denim into home insulation to help building efforts with needy communities around the country. Each year, the Pajama Skate Party keeps getting better and better. With tons of smiling faces, the event was once again a smashing success.